Great price, very friendly to deal with and outstanding work , will post before and after pics… Just wish I got them in sooner, finally I can enjoy my back garden. Dave and Dan did a wonderful job, we couldn’t be more pleased with our gates and filler fencing. From the word go they were an excellent company to work with, they were prompt, efficient, friendly, clean, tidy and the price was very reasonable for the quality of the workmanship. We cannot recommend them enough, and if you are thinking of using them, I would say go for it, you will not be disappointed. Dave came recommended, and was even able to re-arrange other clients in order to fit my job in at very short notice… we needed a new fence and gate to be fitted ASAP in order to re-home a rescue puppy who may otherwise have been able to escape. The new fences and gate look great, and we really appreciate the workmanship and for re-arranging your other clients. Thanks. 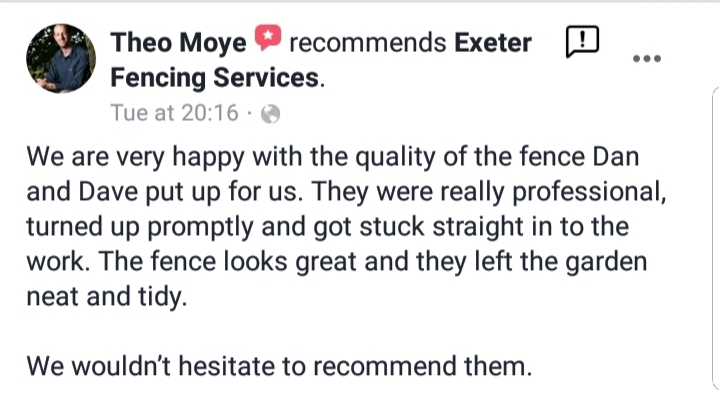 We were very impressed with the service from Dave and Exeter Fencing Services. They did an excellent job and kept to agreed timings and budget. All in all, the whole project was undertaken in a thoroughly professional way from start to finish and we have no hesitation in recommending EFS to others. My partner and I are extremely pleased with our new garden fence and made to measure gate. The finish is imaculate and the work they have done for us has been fantastic value for money. They kept us in the picture all the time when it came to what they have done and what they intended to do, making sure we were happy with everything from start to finish. 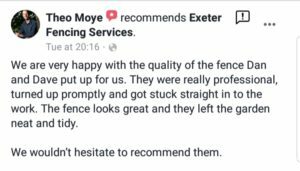 We have every confidence that our daughter will now be able to enjoy her safe new garden which could not have been achieved without Exeter Fencing Services’ help. They have done a fantastic job and we would recommend them to anyone without a moments hesitation.